"Veinte, por favor." (20, please [admittedly, I sometimes switch up the number of kisses I ask for]). "Si, por favor." (Yes please). At this point, he has finished assembling my burrito. Usually the hungry people behind me in line are completely annoyed by our little song and dance, but they have to just sit tight for another minute, because once my burrito is wrapped in foil, he has to draw a picture on it for me with a Sharpie. Usually some combination of hearts, flowers and the number of besos I asked for. I am then handed the burrito, which I bring to the counter where I pay, fill a little cup of salsa verde at the salsa bar, and then make my way home. Personally, I think my taqueria is superior to most in the neighborhood (which means a lot in the burrito-centric Mission area of San Francisco). 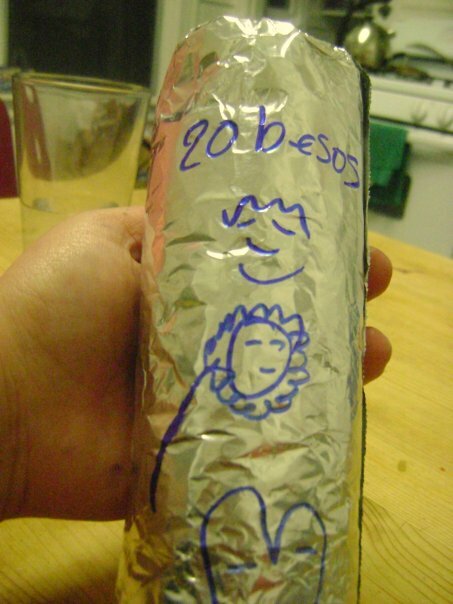 I admit, there are perhaps a few that are better, but never once have I been offered besos with my burrito or had anything other than my order number scrawled on foil in Sharpie at another taqueria. And at the end of the day, I go where the besos are. What a wonderfully sweet story! You're not going to get that at Chipotle!